Africa is the world's second largest and second most-populous continent, after Asia. At about 30,221,532 km² (11,668,545 mi²) including adjacent islands, it covers 6.0% of the Earth's total surface area, and 20.4% of the total land area. With more than 890,000,000 people (as of 2005) in 61 territories, it accounts for about 14% of the world's human population. 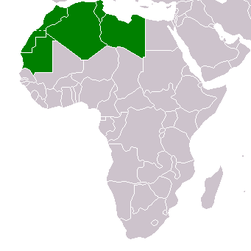 The continent is surrounded by the Mediterranean Sea to the north, the Suez Canal and the Red Sea to the northeast, the Indian Ocean to the southeast, and the Atlantic Ocean to the west. L' Afrique est le second continent au monde par sa population et le second (ou le 3è selon que l'on considère l'Amérique comme un ou deux continents) par sa superficie, après l’Asie. D’une superficie de 30.221.532 km² en incluant les îles adjacentes, l’Afrique couvre 6,0 % de la surface du globe terrestre, et 20,3 % de la surface des terres émergées. Avec une population de 900.000.000 habitants (en 2005), les Africains représentent 14% de la population mondiale. Le continent est bordé par la Mer Méditerranée au nord, le Canal de Suez et la Mer Rouge au nord-est, l’Océan Indien au sud-est et l’Océan Atlantique à l’ouest. L’Afrique comprend 46 pays en incluant Madagascar, et 53 en incluant tous les archipels. العربية أفريقيا وتسمى كذلك"القارة السمراء"، هى ثاني أكبر قارة بالعالم بعد آسيا. يحيطها البحر الأبيض من الشمال والبحر الأحمر والمحيط الهندي من الشرق والمحيط الأطلنطي من الغرب وفي أقصي شمال شرقها تتصل بآسيا براً في شبه جزيرة سيناء. وأفريقيا قارة متعددة الثقافات وبها مئات اللغات المختلفة. و العديد من القري بها مازالت تعيش عيشة بدائبة لم تتطور منذ مئات السنين. Afrika ni bara kubwa la pili duniani. Bara hili lina eneo la kilometa za mraba 30,244,050 na zaidi ya wakazi milioni 800. Asia ndio bara pekee kubwa kushinda Afrika. A África é o segundo continente mais populoso da Terra (atrás da Ásia) e o segundo continente mais extenso (atrás da Ásia). Tem cerca de 30 milhões de km², cobrindo 20,3 % da área total da terra firme do planeta e mais de 800 milhões de habitantes em 54 países, representando cerca de um sétimo da população do mundo. More images Africa - Africa (Category). 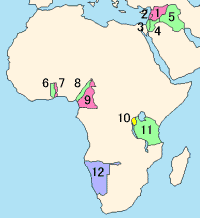 This section holds a short summary of the history of the area of present-day Africa, illustrated with maps, including historical maps of former countries and empires that included present-day Africa. Map of the Ancient Near East during the Amarna period, showing the great powers of the period: Egypt (green), Hatti (yellow), the Kassites kingdom of Babylon (purple), Assyria (grey), and Mittani (red). Lighter areas show direct control, darker areas represent spheres of influence. The extent of the Achaean/Mycenaean civilization is shown in orange. 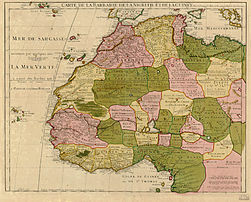 Senegambia, Andrees Allgemeiner Handatlas, 1st Edition, Leipzig (Germany) 1881, Page 96, Map 1. Map showing the approximate distribution of Bantu (dull yellow) vs. other Niger-Congo languages languages and peoples (bright yellow). High index values, indicated by lighter colors, show the relative poverty of African countries as ranked by the UNDP's 2004 list of countries by quality of life. Map of Africa coloured according to the percentage of the Adult (ages 15-49) population with HIV/AIDS. Colour chart available in description.